I know I'm making too big of a deal out of this, but it's bugging me. 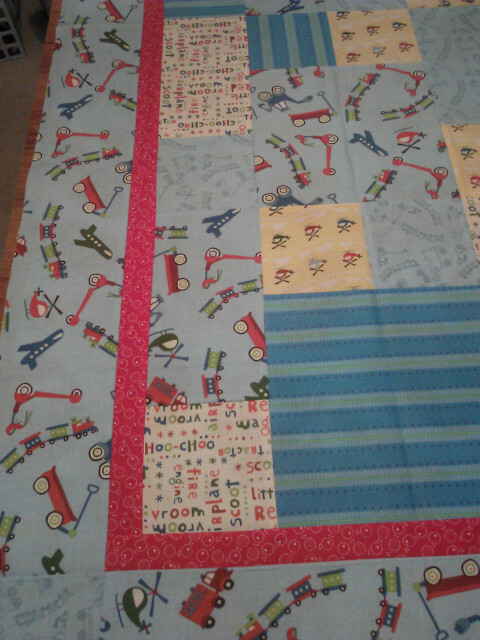 I made a Take 5 quilt for a great nephew, and added a narrow one inch border with an outer border that's 4 inches, which is the width of the pieces making up the block. I thought I would use fleece for the backing, but the top is about an inch too wide on the sides...plus I will need to use a thin batting to keep the backing from showing through. Here are my questions - should I cut an inch off all the way around to keep it square (I'm concerned that the outer border will look too narrow then), or just use some regular fabric for the backing? This was supposed to be a quick easy thing and it's been laying around since last summer! If you cut the inch off all the way around, that will make it just the size of the top. The quilt might 'take up' a bit in quilting and so having the backing exactly the same size might be an issue (if you are having it long armed, it will really be an issue). I think I'd just go with a different backing. Plan "B" would be to cut 2" off all the way around. This would make it half the size of the block and give you enough over so you could use the fleece. b) add a strip of same kind of fleece to the fleece. Others may have better ideas than mine, though! I woul piece the backing, even if it is fabric left from the top. I love QB! Thank you all so much for responding! As soon as I saw Paper Princess' reply, something clicked. 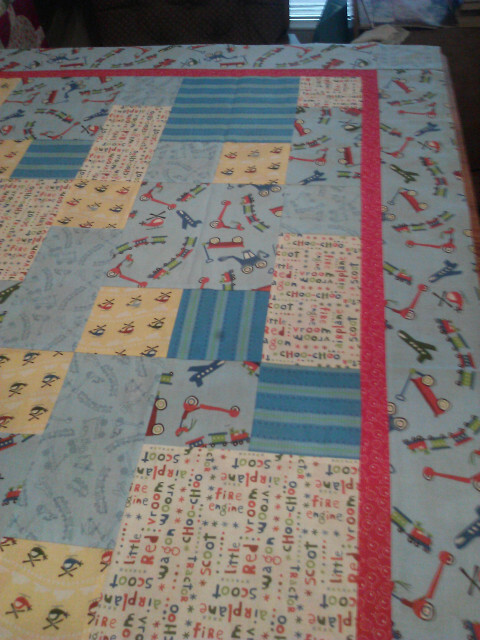 I finished cutting off 2 inches all the way around the quilt before I even saw cathyvv's and adamae's replies. :-) It looks fine. I have some cute fleece that my nephew will probably like better than the top anyway, so decided to use that instead of buying something new. DH works until 9pm so I have lots of time today to get it machine quilted and done! The three of you did your good deed for the day! Sounds like you made a good decision. Cute quilt, by the way! That is a cute quilt. Glad you found a good solution to your problem. One more UFO bites the dust! You could do an extra wide binding? Have the regular 1/4 showing on the top but have 2 inch shing on the back. If you cut 7 inch double fold binding it would be 3 and 1/2 folded. Minus 1/2 inch for the edges sewn to the front and that should give you 2 inches at the back? Just a thought.